Mary Wright is a specialist knitting instructor, living in Cornwall. Her work has been exhibited extensively throughout the United Kingdom and in Japan. 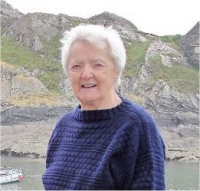 Since the first publication of Cornish Guernseys & Knitfrocks in 1979 she has given many lectures and broadcasts.